The vision for The Peace Corps Yoganda Project began the day I received my invitation letter to serve as an Education Peace Corps Volunteer in Uganda, which happens to be day I began my 200-hour yoga teacher training at CorePower in Los Angeles. At the time, there was no way of knowing how my yoga journey would mesh with the great adventure of being a Peace Corps Volunteer in East Africa. Fast forward a year full of new beginnings and challenges with both life and yoga, and my vision is slowly becoming a reality. Tucked away in the Kigezi hills of Southwestern Uganda, Kabale is a dusty cowboy town close to the border of Rwanda and its infamous Mountain Gorillas, and is now the home of The Peace Corps Yoganda Project, which aims to introduce yoga into Uganda. Once a week, a free community class is held at The Mpambara Cox Foundation (MCF), a Ugandan-run organization that develops sustainable social programs to help alleviate poverty in Africa. 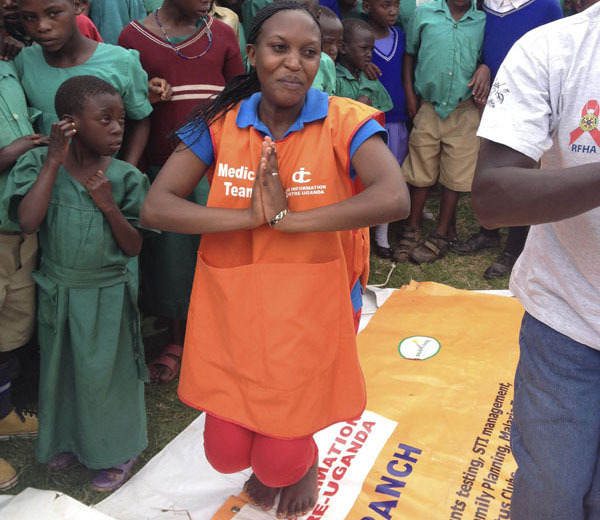 This partnership between MCF and the Yoganda Project provides a platform for Americans and Ugandans to practice and explore yoga as an interconnected community. The MCF office serves as computer lab, library, a space for a women’s micro-loan program, and now, a yoga studio. By teaching the physical and mental benefits of yoga, I’ve been able to engage Ugandan men and women of all ages, while learning to grow and adapt as a teacher. Ugandans work hard and spend little time caring for themselves. With large families and long days, they often end up neglecting their own personal health. Yoga helps Ugandans develop a sense of body awareness, flexibility, and strength. Most importantly, it serves as a reminder for them to breathe. Since yoga is such a foreign concept to the community, our classes are full of challenges and lots of laughter. A class favorite is definitely Ananda Balasana, aka Happy Baby. As the interest in yoga grows, so does the class size. Right now, classes are held on large tarps since we lack funds to provide our yogis with proper mats. In order to continue to practice safely and effectively, however, the Peace Corps Yoganda Project is in need of donated yoga mats or the funds to help purchase mats in Uganda. For more information or interest in donating to The Peace Corps Yoganda Project, please contact me at [email protected]. 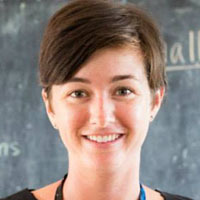 by Amanda Throckmorton - Amanda is a yoga instructor and Peace Corps Volunteer living and serving in Uganda. She believes most problems in life can be cured with either humor, yoga, or a good glass of wine. Know more about Amanda here and follow her on Instagram.